This Kitchen Remodeling job has Fir Cabinets with oil rubbed bronze cup pulls and knobs. The remodeling of the kitchen also includes glass upper cabinet doors with glass shelves and inner cabinet lighting. In the back you see linear mosaic tile back splash. We also installed beautiful paper stone counter tops with a custom drain board cut in to the counter top. There is an under mount Blanco sink along with under cabinet lighting. And the entire kitchen is covered with a tiled slate floor, with stainless steel appliances, recessed can and drop pendant lighting. This particular remodeling job was done in Eugene. However, we also service the towns of Coburg, Cottage Grove, Creswell, Elmira, Goshen, Jasper, Junction City, Harrisburg, Pleasant Hill, Springfield, and Veneta. 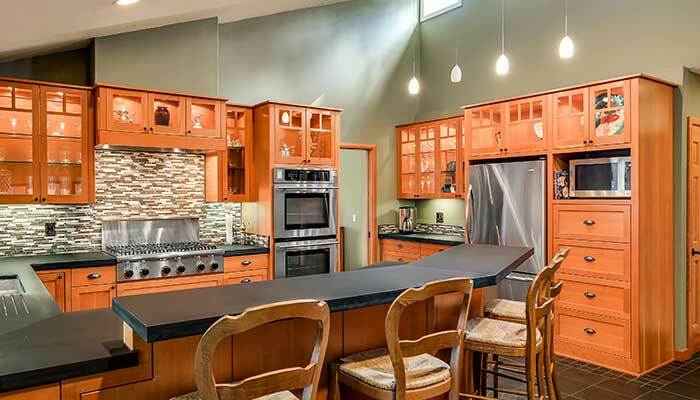 Let’s discuss us becoming your Kitchen Remodeling Contractor by contacting Castile Construction today.